On this episode, the gang celebrates the 20th anniversary of the legendary Timecop! Why did they need those rocket cars to time travel? Why is Ron Silver carrying out this ridiculous time robbery scheme? And how are they not recognizing their one-decade-older selves? PLUS: A twenty year mystery is solved. 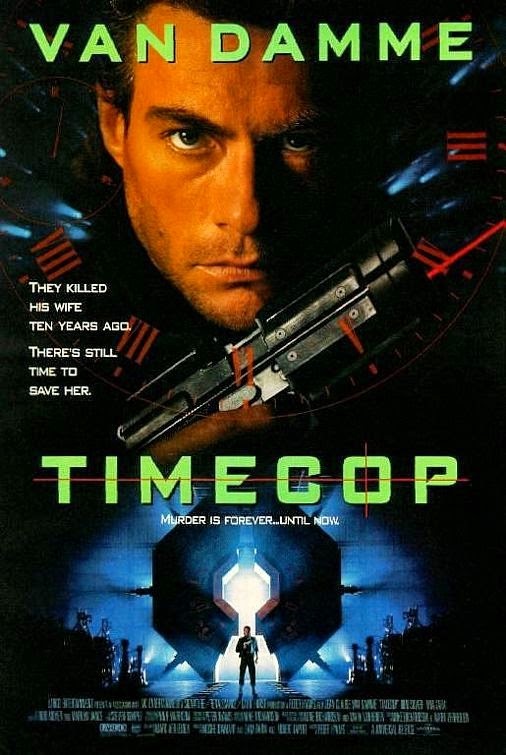 Timecop stars Jean-Claude Van Damme, Ron Silver, Mia Sara, Bruce McGill and Gloria Reuben; directed by Peter Hyams. All of the Jean-Claude Van Damme accents just keep sounding more and more like Triumph the Insult Comic Dog as this episode goes on. But it still works for me. The time travel thing, you guys took issue with. Here is how it works. they get up to speed and hit the star gate thing. they go back in time. the wrist band keeps them in the past. when they deactivate it or what ever, they are snapped back to the very second they left so to the people in the future it looks like they never left..... I'm just saying in the movie and its time travel rules it works. "All of the Jean-Claude Van Damme accents just keep sounding more and more like Triumph the Insult Comic Dog as this episode goes on. You mean Mortal Kombat's Raiden? People say "I spit out my coffee" or "I ran off the road" all the time when referring to something funny they heard, but I did both at the "legs don't move like that unless they're being pulled by the Devil!" line.